It is a real pleasure for me to attend this celebration dinner. It marks the fourth anniversary of founding the Young Icebreakers. This is the third time that I have joined the Young Icebreakers anniversary festivities. Young Icebreakers represent the spirit of the future. 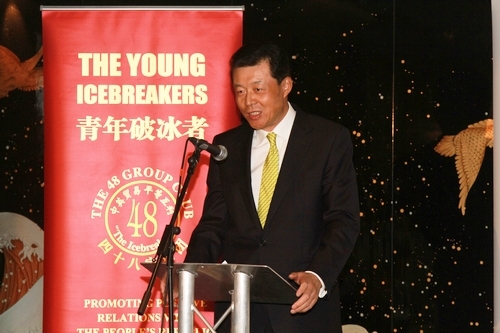 But Young Icebreakers are growing from a foundation that is symbolic of 'Old Friends of China'. In Chinese culture we have great regard for 'Old Friends'. Amongst the most respected of the 'Old Friends' is the 48 Group Club who were the pioneers of 'Icebreaking'. They in turn inspired the foundation of the Young Icebreakers. Sixty year ago, the first generation of 'Icebreakers' overcame obstacles between China and the West. They broke the thick ice and started win-win economic ties between China and the UK. What they did is a shining example of vision and courage. There is much that the young of today can learn from these pioneers. · We successfully resolved historical issues in our relations. · We established a comprehensive strategic partnership. · Our exchanges and cooperation in various fields have greatly expanded. · Does thick ice still exist between China and UK? · What is the point of having Young Icebreakers? My answer to these questions is this. It is true that many visible obstacles have disappeared. But, invisible ice remains in some people's minds. That is why more 'Icebreaking' is much needed. Effectively managing these differences is crucial to the long-term, stable and healthy development of our relations. Then how can we make sure these difference do not stand in the way of China-UK relations? I believe the two governments, especially political leaders, should view the bilateral relationship from a strategic and long-term perspective. They should respect each other's concerns and interests and seek common ground while putting aside differences. They should be committed to creating a sound atmosphere for China-UK relations. I believe business communities, educational, scientific and cultural sectors of the two countries should deepen cooperation. This will in turn push forward our overall bilateral relationship. I believe the youth of the two countries should increase exchanges. They need to strengthen the bonds of friendship through better understanding. Friendship between young people will lay the foundation for the future development of our relations. 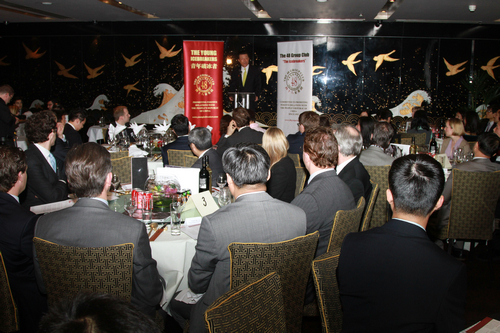 · Those people strike notes of discord about China's fast growth and fundamental contribution to the global economy. They either play up China as a world threat or predict the collapse of China. · Those people turn a blind eye to the advances in China's human rights cause and progress in China's political reform. They cling to the cold-war mentality. They relish smearing China through cooking up so-called "China human rights report". · Those people fail to respect the right of China to safeguard its sovereignty and national unity. They are bent on showing support for Tibet independence separatist forces. · Those people criticise China for being irresponsible when China stresses peaceful settlement of international disputes and opposes interference in internal affairs of other countries. You are the young generation of British people who understands China. 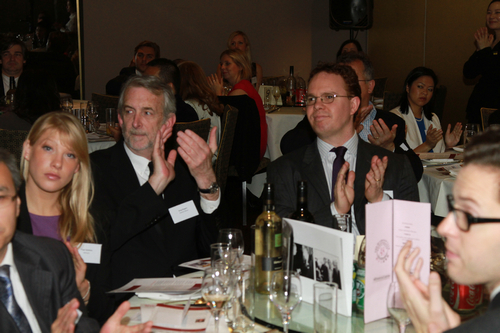 You are representatives from all walks of life in British society who are committed to China-UK cooperation. Some of you may become political leaders in the future. So, advancing China-UK relations is your responsibility and your mission. I suggest that Young Icebreakers look back for their inspiration about moving forwards! The original 'Icebreakers' showed the value of vision and courage for breaking ice between the two countries. Young Icebreakers today need to thaw the ice in people's minds. This will require an equally pioneering spirit with confidence and patience. Young Icebreakers also need to summon up wisdom and ability to build the bridges of understanding between our two peoples. Young Icebreakers, I trust your confidence, patience, wisdom and ability. In addition we must step up our continued joint efforts. If we do that, then ice in all forms will be broken and the future China-UK relations will advance more smoothly.